Love collecting monsters? Step into the world of Monster Chronicles! 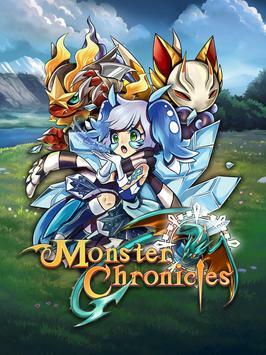 Step into the world of Monster Chronicles – An adventure wrought with creature collecting, breeding, and awesome puzzle style combat! Embark on an exciting and brand new Monster Collecting RPG experience featuring – you guessed it – Monsters! Begin a fantastic journey to uncover the secrets of this mysterious new world filled with a vast array of both cute and fearsome beasts. Collect em’, hatch ‘em, breed ‘em, and bring them into battle as you take on the challenge that is Monster Chronicles! ● Fun & Original Battle System – Take down enemies in a fast paced strategic tactics-puzzle mix! ● Breed, Hatch, & Collect – Create a Monster Dream team as you mix and match to find the best combinations. ● Live PvP & Ghost Mode – Take the fight online to face other players from around the globe, or leave a “Ghost” of your Monster to help your friends while you’re away! ● Event Dungeons – Explore carefully crafted adventures, featuring tough challenges and rewarding loot. ● Rich Storyline – Follow the single player quest to uncover a deep and surprising fantasy tale.